Words by Timeless Luxury – The NBCF Nomos Club Campus is a collaboration between the National Breast Cancer Foundation, Nomos Glashütte and Timeless Luxury Watches. There are two versions of the NBCF Nomos Club Campus available, a 36mm and a 38.5mm model. The smaller model features a white silver-plated dial, a pink seconds hand and pink outlines for each numeral. The larger model features a dark blue dial, a pink seconds hand and light blue minute markers. Each is powered by an Alpha hand-wound movement, upgraded with the Nomos swing system. Both feature steel case backs with an engraving of the NBCF logo, a symbol of life, growth, and hope for the future. 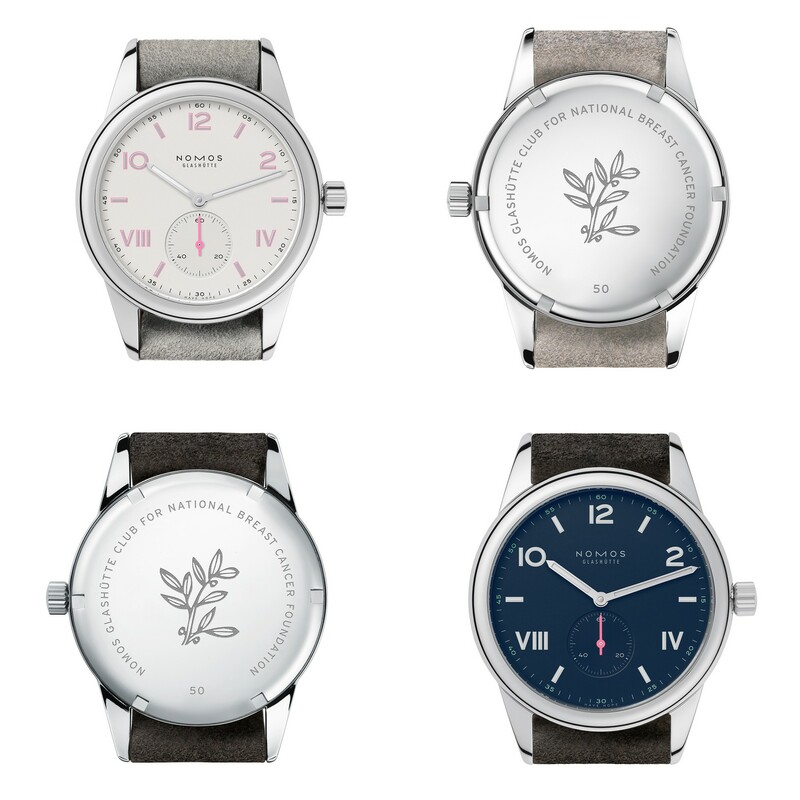 Custom engraving is available on the back of each NBCF Nomos Club Campus. A portion of each sale goes to fund the National Breast Cancer Foundation. The price for the NBCF models is the same as the original 36mm and 38.5mm Nomos Club Campuses, $1,500 for the former and $1,650 for the latter. Unlike previous Timeless/Nomos watches, the NBCF Nomos Club Campus is not a limited edition, but rather a regular production model which is intended to create a continuous contribution to the National Breast Cancer Foundation. Each is expected to arrive this March.